A spectacular setting among rolling meadows this 1902 stone and log home was remodeled and added to in 1998 and features 4,370 square feet. Four bedrooms, three and-a-half bathrooms, living room, family room and private master suite with vaulted ceilings and balcony enveloped in views. Several outbuildings including detached 3-car garage, large morton barn, three stall barn, grain storage and cabin part of original homestead. 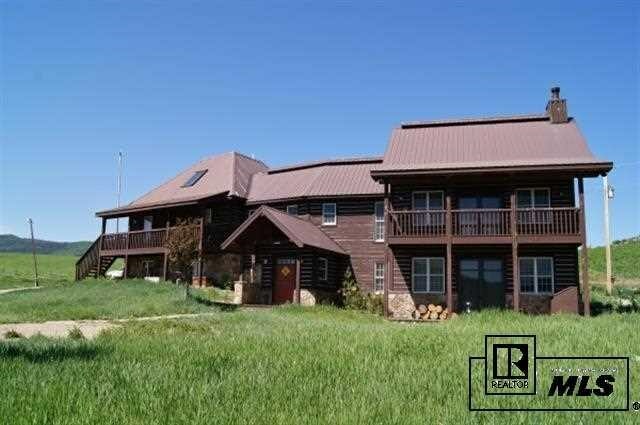 The property is almost entirely fenced and includes two adjudicated springs, pond and irrigation rights to year-round Salt Creek allowing an ideal horse property in an extremely private locale.